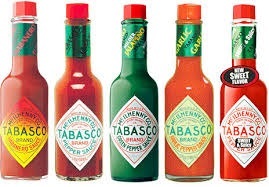 Tabasco sauce is a brand of hot sauce made exclusively from tabasco peppers (Capsicum frutescens var. tabasco), vinegar and salt. It has a hot, spicy flavor. The sauce is produced by the US-based McIlhenny Company.